Description from the publisher: Play Dirty – and get a Reaction! You can pack a lot of fun into a small box, especially when you pack it full of microbe meeples. I’ll say it again. Meeple Microbes (squeeee!) In this nasty little 2-5 player game, your boss, Dr. Lillian Johannae has made a groundbreaking discovery in the field of microbiology. She has discovered a new breed of extremely unstable, highly volatile microorganisms, BIOTIX™ (patent pending and pronounced ‘biotics’) that can uneasily coexist within a small system. Now she needs supporting data. But science can be a brutally competitive field. What began as an innocent pursuit of discovery has quickly devolved into self-centered posturing and ruthless backstabbing among her lab personnel, all vying to have their name attached to the research paper, thereby rocketing them you into scientific superstardom. Your mission, carefully grow the largest culture of BIOTIX you can in your petri dish – and sabotage the work of others by pushing their microbe populations above their limit, causing them to explode and bio-react in all sorts of fun ways. 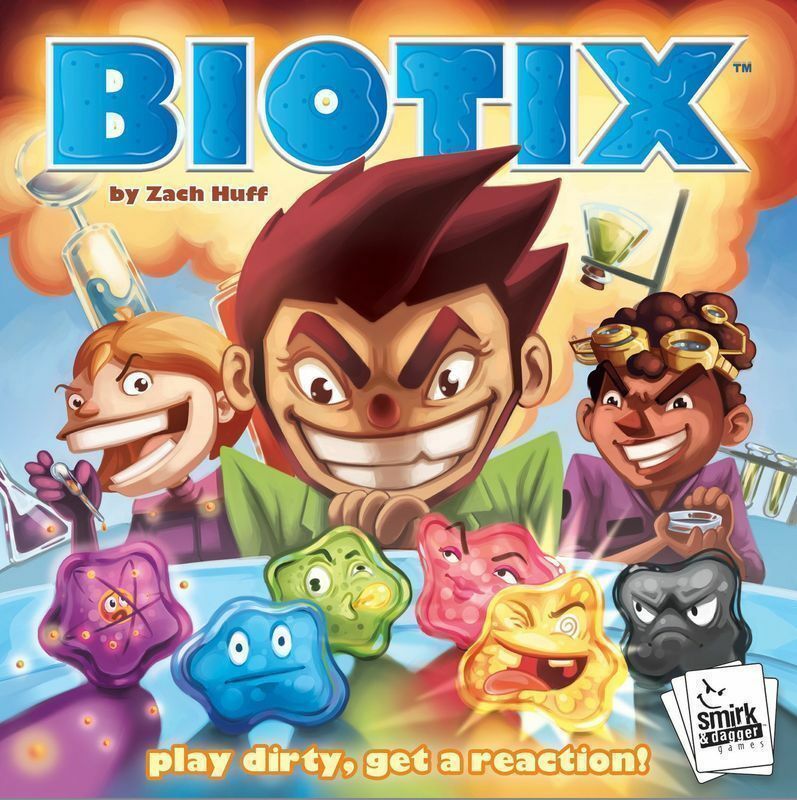 Game play is simple: on your turn, draw two BIOTIX from the specimen bag and place them, one at a time, either into your own dish for points or into an opponent’s dish to try and force a bio-reaction to destroy their work. Each of the five BIOTIX species has a different trigger number and a unique bio-reaction when they ‘go off’. It may force you to trash the microbes, force microbes from your dish into the petri dishes of others, steal microbes or wipe out a species across the whole table. The BIOTIX are in a constant state of flux throughout the game, as is your score, because at the end of the day you gain points for the BIOTIX remaining in your dish, with the most volatile BIOTIX being worth the most points. The best score over 3 days of research determines the winner! Then try the advanced game, with Aggressive BIOTIX, a cancer-like organism that mimics the properties of the BIOTIX they replace in your dish – except they are worth negative points instead of their usual values.